The TPC-4 (TPC standing for "Turbo Pad Control") is a third-party controller manufactured by Dynacom compatible with the Sega Master System. 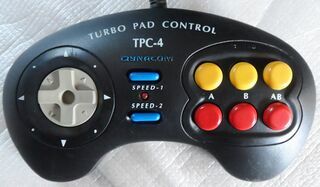 It is the "fourth" in their "Turbo Pad Control" series, though all other entries were compatible with different consoles (the TPC-2 for example was built for the Sega Mega Drive). The Sega Master System only has two buttons, but the TPC-4 ups the number to six. As well as and ( and ) there is an "AB" button which triggers both buttons simultaneously, turbo versions of these buttons, and two extra blue buttons to adjust those turbo features. It is likely that the TPC-4 was pushed out of production by Tec Toy (much like other Dynacom products) as Dynacom did not hold an official license by Sega.